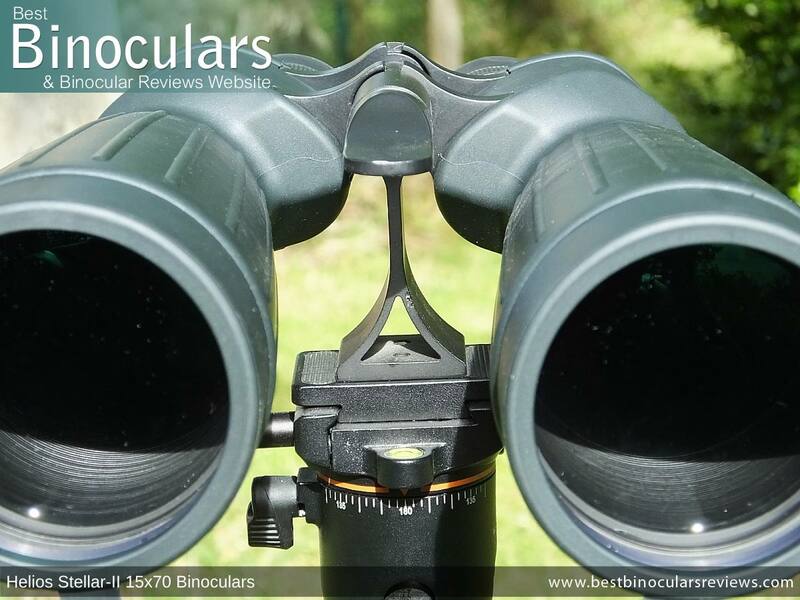 Please Note: This review of the Helios Stellar-II 15x70 binoculars was mostly written by Philip Pugh. A very experience amateur astronomer, he had his first magazine article published in 1980 and has published four books in Patrick Moore's "Practical Astronomy" series. After also using and testing these Helios binoculars myself, I have also added my own thoughts to the review where I have thought appropriate. I would also like to thank First Light Optics for very kindly loaning us these binoculars to test. 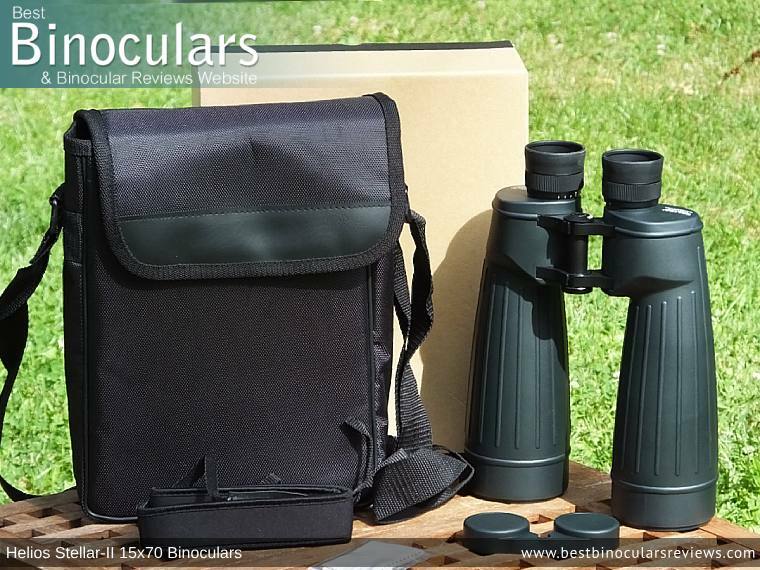 As well as this instrument, they stock a huge range of binoculars, scopes, telescopes and a lot of other related equipment for astronomy, birding, marine observation, wildlife observation and general use. 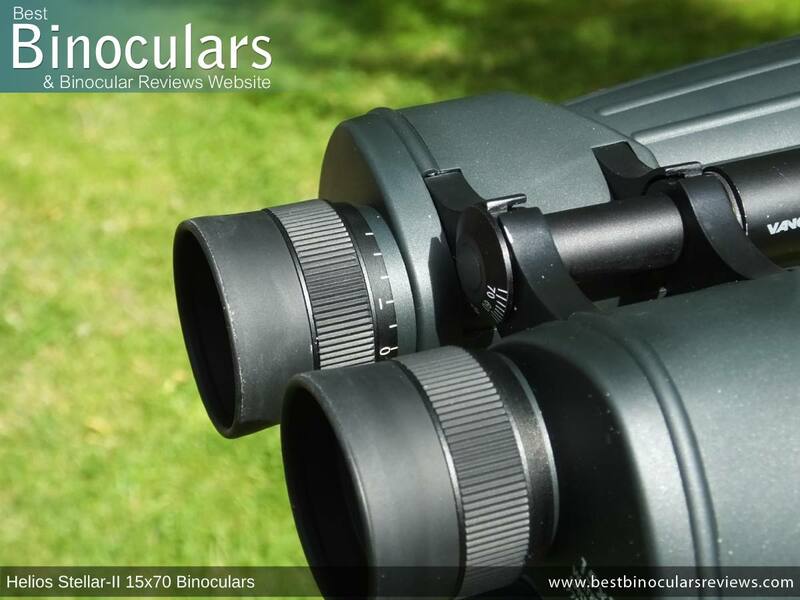 The Helios Stellar-II 70mm binoculars have been designed and developed for medium to long range terrestrial and astronomical use. 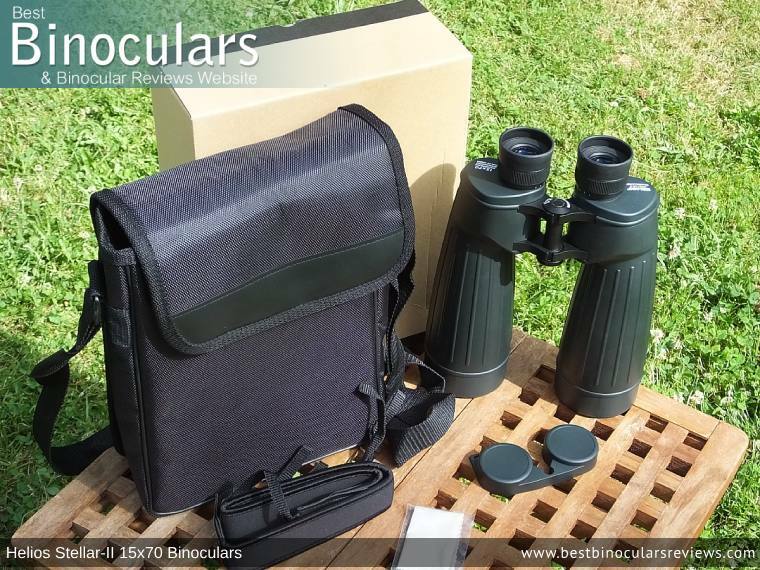 I was particularly interested to try them, as I have owned a pair of Helios Stellar 70mm binoculars since 2002 and used them extensively for astronomical use. However, in a positive way, they are very different from my binoculars, so the "Stellar-II" label is a bit of a misnomer. Optically, they are vastly superior to my old Stellar binoculars and as you will read below, I thought they performed particularly well on faint objects. 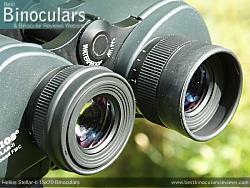 These 70mm Helios binoculars are also available with a magnification of 10.5x. Although I have not tested this alternative model, experience suggests that they provide a wider field of view, allowing you to see some of the larger star clusters in their entirety. The downside is that for objects, such as the Moon, some of the detail is lost, as the lunar disc appears smaller. 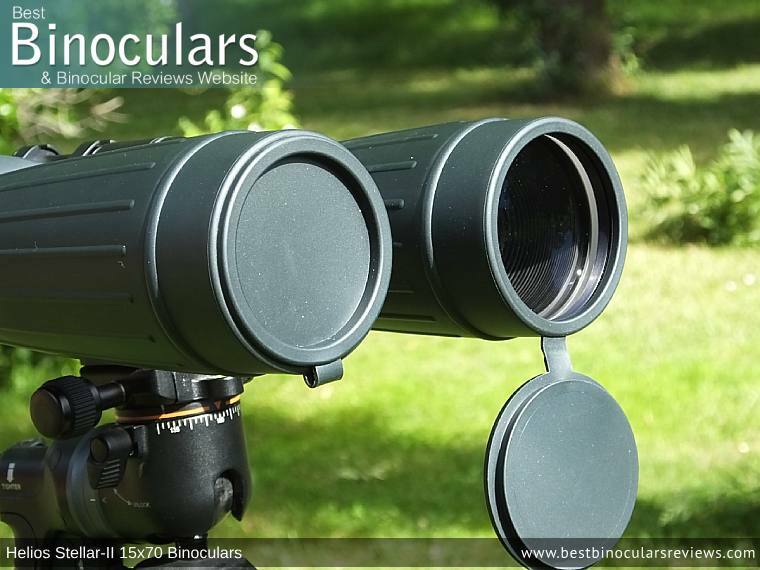 These Helios Stellar-II binoculars have a strong build quality of the Bausch and Lomb / porro prism design. They have a ribbed rubber armour, that makes the binoculars shock resistant (I was naturally reluctant to test this!) and easier to grip. The main housing is magnesium, which has a good strength/weight ratio. They are reputedly waterproof (again, I did not test this). The objective lenses are set back 11mm from the end of the housing. This makes them somewhat resistant to condensation. I was not able to verify this, as I tested them in the English spring. With a weight of 1.75kg (over 2lbs) and a powerful 15x magnification, a tripod attachment is almost essential for achieving a steady view and a thread for a tripod adaptor is provided. These Helios Stellar-II 15x70 Binoculars have an individual eyepiece focus system (see image above), which is sometimes somewhat confusingly referred to a fixed focus or auto focus binoculars. This is because once you have correctly calibrated the binoculars to match your particular vision, no further adjustment is necessary and everything will remain in focus from their minimum focal distance to infinity. The advantage of this, especially for uses like astronomy is that once you have done this, no further focusing is required. 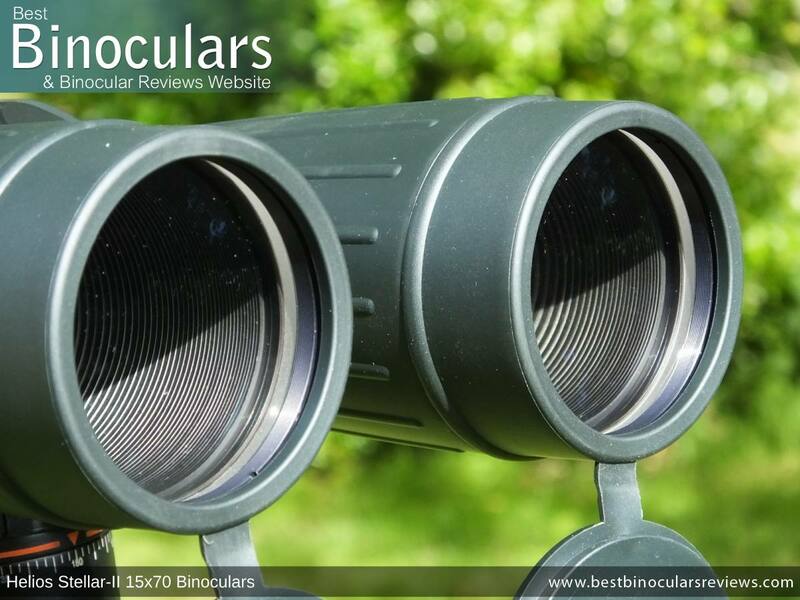 The downside is the relatively long minimum focus distance of this means that binoculars like these are most certainly not the right option if you are someone who often finds yourself wanting to observing anything from close range. The eyecups can be folded down for some spectacle wearers but the generous eye relief of 20mm means that many spectacle wearers do not need to fold them down. The inter-pupillary distance can be adjusted from 56 to 74mm. Each eyepiece can be focussed individually, which I prefer for astronomy and at a focus of infinity (usual for astronomical use), the Dioptre adjustment is for me 5 dioptres either side. The binoculars are slightly larger than my personal pair, so use up quite a large space in hand luggage when travelling. The body is internally filled with nitrogen to eliminate the possibility of water vapor inside. 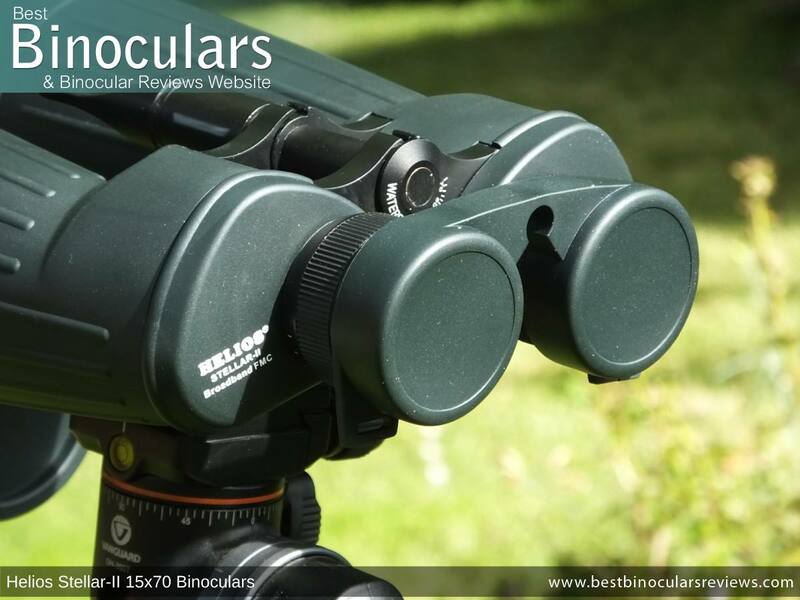 The Helios Stellar-II 15x70 binoculars are very well-built using a magnesium frame and not plastic. This makes them somewhat heavier than many binoculars of similar size. Is it likely to be a long observing session or a quick scan before bedtime? Could it cloud over while setting up a tripod? Should you "get outside fast" to catch something before it disappears? Are your hands steady enough to hand-hold large binoculars for a while? Most people would say "no". In general, keeping binoculars steady with a tripod helps you to see more detail on large objects and fainter objects than you can see with hand-held binoculars. 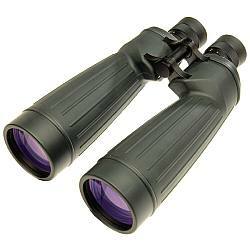 This is especially noticeable with large binoculars with high magnification, such as these. Note that neither a tripod nor adaptor are supplied with the binoculars. The objective lenses are a full 70mm aperture and are not internally stopped. They are of the standard achromatic design. Note that use of extra dispersion (ED) lenses or apochromatic lenses cost considerably more. Binoculars of this aperture deliver more detail and can detect fainter objects in the night sky than the 30-50mm instruments that are normally used for bird watching. The prisms are porro prisms and use Bak-4 glass. This is all pretty standard and certainly what I would expect to find at this price range. The objective lenses and oculars are fully multi-coated, and according to Helios, the are able to transmit 85% of the incident light. The amount of anti-reflection coating used is one of the key features of what to look for when buying binoculars. You can also read more on Anti-Reflection Lens Coatings here. At 77m wide at 1km (4.4 degrees), the FOV is pretty good for a 15x magnification. This allows most deep sky objects, including the Andromeda Galaxy to be seen in its entirety without the need to pan the view. This is one of the major advantages of using a binocular for astronomy and is why they are often used alongside a more powerful telescope which will naturally have a much narrower field of view. At 22 meters, the minimum focus distance is obviously not going to be suitable for uses like viewing butterflies or flowers from close range. However this is not what they are designed for and a relatively long close focal distance like this is perfectly normal for a fixed focus (individual eyepiece focus). Remember once you have calibrated them to your eyesight, everything remains in focus from 22m, right up to infinity and thus they need to ensure that they have a very long depth of view to remain in focus over such a long range. Those who want or have to wear eyeglasses whilst using their instrument, will be happy to read that these have a full 20mm of eye-relief. This is excellent and will almost certainly be enough for you to maintain the full image without any black rings on the edges of the view. It was a pleasure to use these binoculars on the night sky, especially on fainter objects. Unlike terrestrial use, colour reproduction is not as noticeable for astronomical use. I tested it on some trees during daylight and was happy with the result. 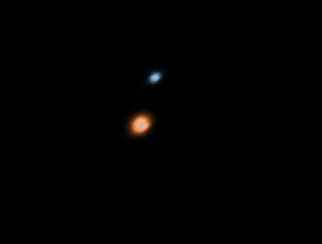 I also checked the double star Albireo (Beta Cygni), which is a double star with blue and yellow/orange components. Although, due to the time of year, Albireo was not well-placed for observation, the colours were identical to those shown in my and other astronomers' photographs, matching the colours shown in the above photograph. Brightness was greater than I expected in a pair of 70mm binoculars. It even caused me a problem, as the solar image was too bright for my filters. What amazed me was that I could see quite faint objects under imperfect conditions. I noticed some orange/yellow colour fringing on the Moon, but it was not bad for an instrument of this size and price. I did not notice it on either Venus nor Jupiter, which was a good result. There was not any noticeable field curvature and there was some minor distortion at the edge of the field of view on star clusters but casual users would not notice it. Overall, the image quality was impressive. I was particularly amazed to have great views of the faint star clusters in the constellation of Auriga (see Using Binoculars for Astronomy) when they were low in the sky and the Moon was nearby. The Moon showed very well through these 15x70 Helios Stellar-II binoculars, with its features much sharper than with my usual star gazing binoculars. The only negative was that there was some false colour (a slight yellow/orange hue on the bright side of the lunar disc) but, to be fair, there was much less than in most budget and mid-price astronomical telescopes. Only super expensive binoculars and telescopes have special lenses that eliminate this problem. I was able to see the Ring Nebula in the constellation of Lyra, even though it was low in the sky. I was amazed to see all three galaxies in the Leo Triplet of M65, M66 and NGC3278. My view of NGC3278, the faintest member of the triplet, was my first ever view of it in any instrument. I was also able to see four of the famous Virgo Cluster of galaxies. Although none of these galaxies appeared as little more than faint smudges of light, they are difficult to detect at all, except in large amateur telescopes. There was no doubt that these binoculars were great at revealing faint objects under suburban conditions. The carry case is made of soft fabric. It has its own strap for carrying, which is soft but not padded. It is easy to use for regular terrestrial and astronomical sessions but is not firm enough to allow for carrying by air. The neck strap uses a rather loose attachment that is present on my binoculars. I am not 100% happy with it, as it sometimes works loose at one end. 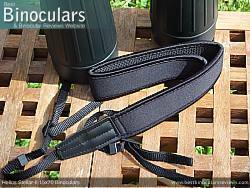 The positive feature of the neck strap is that it is wider and padded in the section that goes around your neck and shoulders. A cleaning cloth is included, which is of similar quality to those I have in a separate cleaning kit. No cleaning fluid is provided. These can be detached and, as they are connected to each other, do not roll around on the ground when dropped. As someone who has dropped lens covers several times, the fold down covers provided with these binoculars is a good idea. They are made of rubber and do not lose shape after being temporarily bent. The only negative is that it was difficult for me to place solar filters over the objective lenses for sunspot viewing. I may possibly be in a minority of one on that activity, though. The warranty period is one year (UK/US). 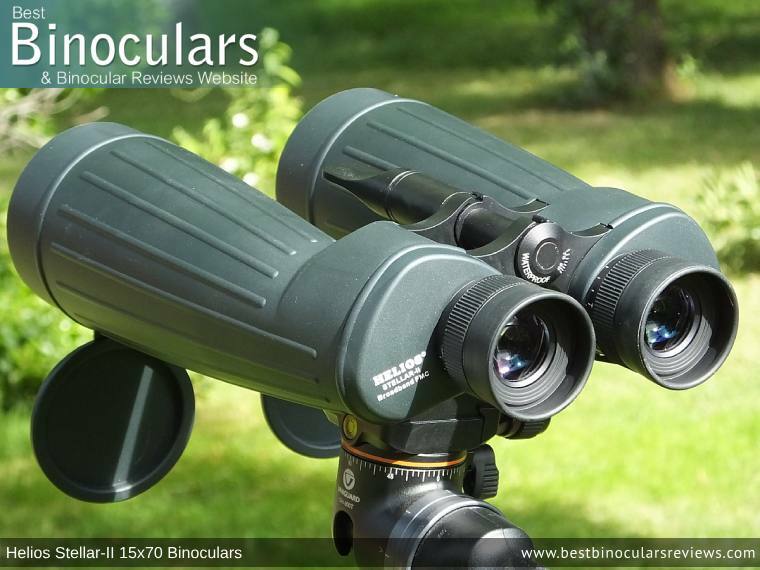 High powered 70mm binoculars specifically designed with astronomy in mind, but which can also very effectively be used for long range terrestrial observation. The large 70mm lenses in combination with a quality fully multi-coated optical system to a great job collecting and then transferring a high level of light to your eyes for bright, high quality views. I was very pleasantly surprised by these binoculars. I was able to see fainter objects and greater detail on brighter objects than I would have expected from 70mm binoculars in suburban conditions. I had tried them out a few times and detected objects that I thought to be invisible. 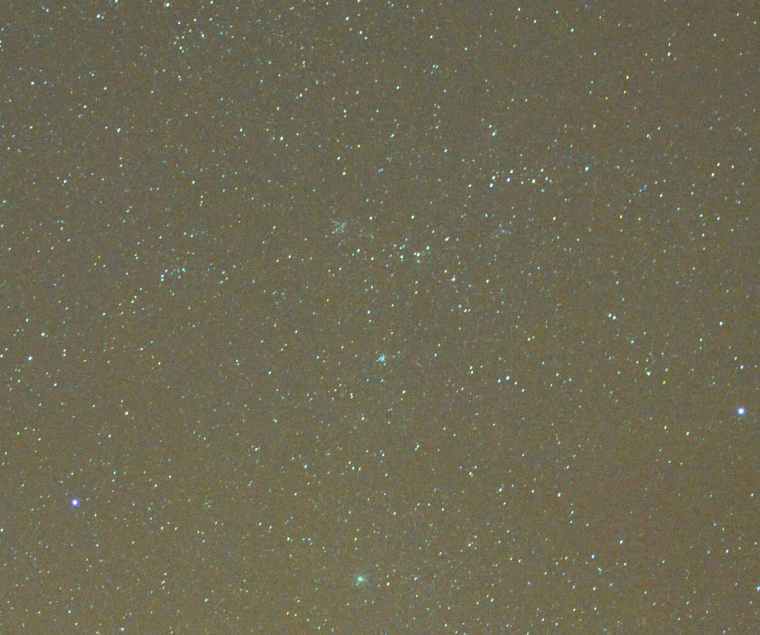 On the more familiar star clusters, I was able to see far more stars than I could with my own 70mm binoculars. Instead of the usual blue colour fringes common in achromatic binoculars and telescopes, there was a slight yellow/orange tint instead on the Moon. However, without the (more expensive) extra dispersion lenses, the colour fringing was less noticeable than I would have expected. I could criticise the lack of a hard carrying-case and quality of accessories but, by providing those, the recommended retail price would probably be more than £200, a psychological barrier to some potential buyers. One small reservation I have is that these binoculars are too heavy to hand-hold for inexperienced observers, even though I hand-held them while performing tests. This makes me question whether beginners would be better off with the 50mm binoculars in the same range. More experienced observers might be tempted by the 80mm or 100mm models if they are intending to use them mostly with a tripod. In conclusion, they are a great pair of binoculars for browsing faint objects in the night sky. 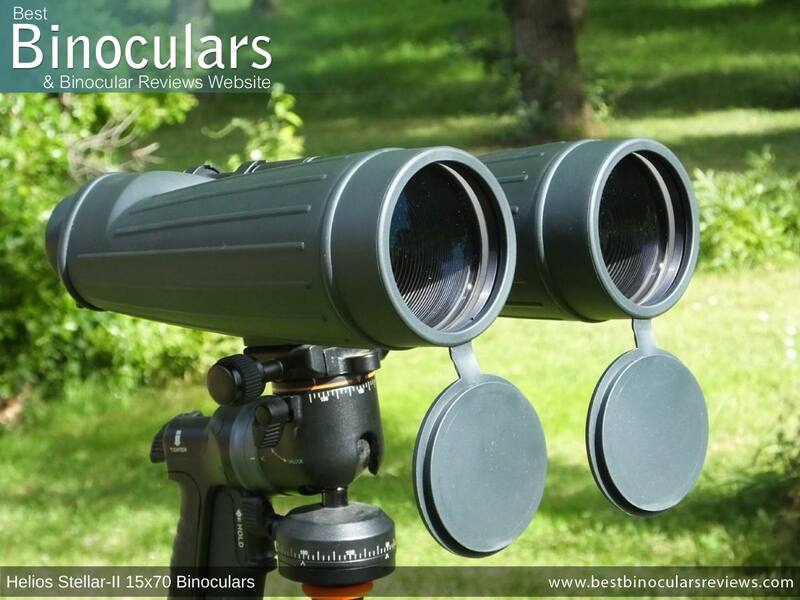 These binoculars are available from First Light Optics as well as a number of other online retailers in your country.